AVON PARK, Fla. – April 4, 2019 – On Oct. 10, 2018, a Category 4 hurricane slammed into Mexico Beach, Fla., having attained peak winds of 155 mph. The hurricane leveled homes, toppled trees, and downed power lines, leaving some roads impassable. The devastation from Hurricane Michael left 271,998 homes and businesses in Florida’s Panhandle without power, so more than 7,500 workers from 15 states and Canada were called upon to restore power to the region as quickly as possible. Van Crawford, vice president of operations at Peace River Electric Cooperative (PRECO) in Wauchula, Fla. and a South Florida State College (SFSC) alumnus, was one of them. Crawford took along two people from PRECO, and they worked 16 days with Gulf Coast Electric. In addition to that, they had two working crews, consisting of 10 to 12 men working 10-day intervals. While in the Panhandle, the Wauchula native drew from his experience with Hurricanes Charlie and Irma and his knowledge based on PRECO’s emergency response plan. The company reviews the plan and performs drills every year. Crawford was sent to work in Wewahitchka, near Mexico City, in a compound of 700 to 800 people working to restore power to the communities. The other district in the Panhandle had 1,700 men and women. Many of them were members of other statewide associations, contractors, and staff of Florida Electric Cooperative Association—an organization that represents 15 cooperatives across Florida. Cooperatives throughout the state lend each other a hand when a need arises. 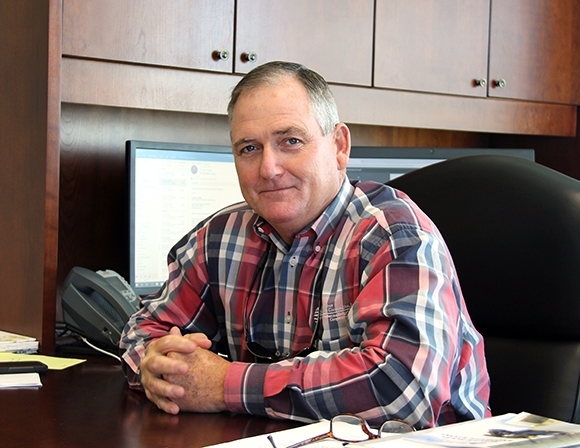 To the Florida Panhandle, Crawford not only brought his first-hand experience with power restoration after a hurricane but his 32 years working for PRECO. He began his career with PRECO in 1987 as a meter reader. After working nine months in that position, he transferred to the line department and started an apprentice program through the Tennessee Valley Public Power Association (TVPPA). In fall 2001, SFSC launched an Associate in Applied Science in Electrical Distribution Technology program in partnership with PRECO. As a show of support, Crawford and three co-workers enrolled in the program. Crawford earned his degree in August 2002 and went on to earn a Bachelor of Public Administration from Barry University. From there, he climbed the management ladder, eventually becoming vice president of operations. PRECO serves approximately 43,000 customers in 10 counties. Crawford is responsible for construction and reliability in three of those districts—Indian Lake Estates, Wauchula, and one in Manatee County. It consists of 3,700 miles of power lines overhead and underground. SFSC’s Electric Line Service Repair program is offered at its DeSoto and Hardee campuses and accepts students in the fall and spring. By completing the year and a half-long program, graduates earn an occupational certificate and a Class A Commercial Driver’s License (CDL).